Beijing is planning to send a fleet of floating nuclear reactors to provide energy in the South China Sea. As well as being installed in the disputed waters by 2020, the boats could also be used to provide emergency relief in the event of natural disasters, such as tsunamis or typhoons. The vessels will be fitted with reactors able to produce roughly a quarter of the power of a typical civilian nuclear power plant. The news emerged after state-owned China National Nuclear Corporation (CNNC) announced it was setting up a new company with funding worth one billion Yuan ($150 million). The vessels are reported to house a sea-faring, 100-megawatt version of CNNP’s ACP100 miniature reactor. Speaking to the Global Times Chen Xiangmiao, a research fellow at the National Institute for the South China Sea, said: “The floating nuclear plants could provide the energy requirements of the islands and reefs in the South China Sea. “The plants will provide environment protection, weather observation, navigation and oil and gas development. As we have previously reported, a five-year plan was published in March last year outlining China’s desire to expand its nuclear generating capacity. The plants would provide energy, heat and even water to remote islands and oil rigs. They will cost about $373 million each. China’s Atomic Energy Agency has already conducted research into key components of the technology. 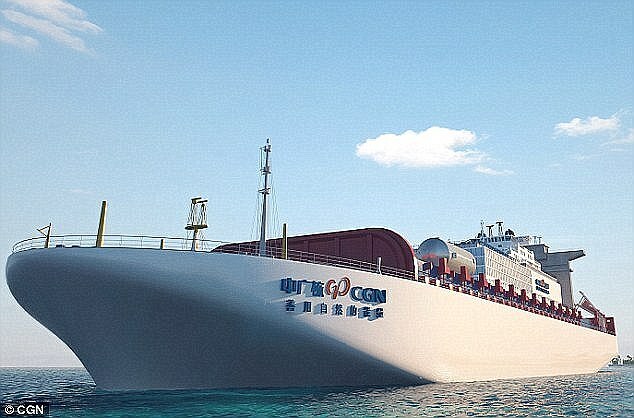 The China General Nuclear Power Group (CGN) started building the ship last November. The ship’s design resembles a cruise liner. The concept of embedding nuclear capabilities into a sea-bound vessel is not a new one. Russia is expected to complete its own floating nuclear reactors next year. The decision to build the ships prompted worries that China could more easily impose its will on the disputed waters. Parts of the area are also claimed by the Philippines, Vietnam, Malaysia, Indonesia and Taiwan. Environmentalists have expressed concerns over the possibility of a nuclear disaster. This is particularly due to the frequent typhoons and other extreme weather events in the region. 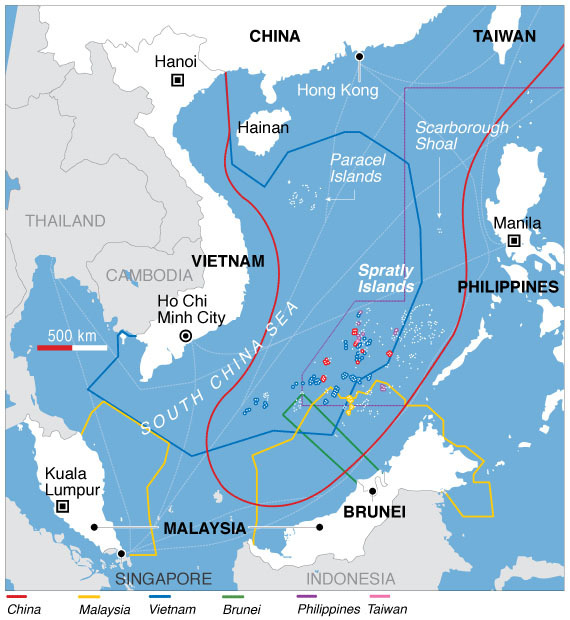 The sovereignty of the South China Sea region has been heavily disputed over decades. Particularly on whether China can claim ownership of the Spratley and Paracel outcrops which may contain natural resources. China says it owns an area defined by a ‘nine-dash line’ which stretches over hundreds of miles of water. They claim their right dates back centuries. A case brought by the Philippines to the United Nations challenging China’s claim ruled in Manila’s favour last summer. However, President Duterte has opted not to emphasise this legal victory in favour of closer ties with China. Tensions have escalated over the past year with concerns over China’s covert construction of artificial islands and installation of military facilities. This week it was claimed that the Chinese had planted a flag on a sand bank near the Philippine-controlled Kota Island.